Over the last several months as I’ve started building this Colorado website, I’ve had the chance to revisit some old images and remember what good times those were – hiking and camping with friends, enjoying mountain views under a full moon, and walking through early morning meadows of colorful wildflowers even when my feet were freezing and soaked with morning dew. Some of my favorite memories come from trips with a lifelong friend who now lives in Denver. Each summer we try to hike a few 14ers as well as take some overnight treks to scenic lakes or waterfalls. He’s patient with my photography, especially around sunrise or sunset, and before long we are on our way again. I think he understands because his wife is a family photographer in Littleton and does great work. To date, we’ve hiked 31 of the tallest peaks in Colorado. Some of our favorites included Humbolt, La Plata, Huron, Holy Cross, and La Plata. The tougher ones, mostly because of the weather or nasty rock, included Columbia (terribly scree), Belford and Oxford (hiked under a full moon at midnight with howling winds at the top), and Shavano (not so bad for me but my friend inexplicably bonked and didn’t carry on over to Tabeguache (he later returned and finished that double as a solo hiker, so good on him!). On most of these hikes we start well before sunrise and are heading down by 10am. At the beginning, the thoughts of why do we do this rage in my brain, but I keep putting one foot in front of the other and by the time we reach the summit and the vast Rocky Mountain landscape stretches out before us, I know why I suffered… and I feel fortunate to have reached the top. On other trips, we’ve sought out beautiful areas in the San Juans. I think our favorite hike was the Blue Lakes trail. I can still remember after more than several switchbacks along the drainage from Lower Blue Lake, we round the corner to our right, looked across the slope covered with wildflowers, and down into a shimmering lake of turquoise. I stopped to photograph the colorful flowers, lake, and peak in the distance. My words can’t do justice to the view, but I’ll remember it for a long time. My wife is a Colorado native, having grown up in the Denver area. She has only climbed one 14er, but has accompanied me on several trips to the San Juans to hike and camp. One of our most memorable hikes was up to Island Lake. Again, the wildflowers were everywhere, especially the blue Columbine. After 5 miles of trail, we finally reached the distinctive and picture-perfect Island Lake. We had departed well before sunrise, so our arrival at this beautiful location found us alone to enjoy the morning, though on our return down the trail we did pass several upward hikers. We make our summer base in Winter Park, Colorado, and know Grand County pretty well. We make several excursions into Rocky Mountain National Park either for exploring, fly fishing, or both. Of course, I do my photography work at sunrise or sunset, always hoping for a colorful sky and even a wandering moose. Just to the southeast of Winter Park, over Berthoud Pass and back down heading towards Empire, there is a little trail that leads up to Bulter Gulch. 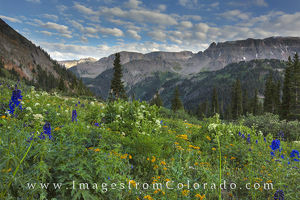 This is one of my favorite places for Colorado wildflowers. Each July and August, the colors in the meadow about 2 miles up the trail are mesmerizing. I know I can leave my bed about 3:30am, make the drive over the pass to the trailhead, and be up to the meadow in time to enjoy a warming sunrise. I’m usually back to the house before my girls are even out of bed! My images bring back some good memories, and I haven’t even touched on the areas around Aspen and Snowmass and the Maroon Bells Wilderness, nor the collegiate peaks near Buena Vista. I guess I’ll save those ramblings for another time. If you have any questions about these photographs of Colorado, please do not hesitate to contact me.